...Nonetheless, the most memorable sights in this stodgy film aren't the real-life visages of WWII heroes being welcomed home after years of POW hell but, rather, the sight of Filipino captain Juan Pajota (Cesar Montano)—after successfully aiding Mucci's campaign against the hated, racist Japanese—giving a laughable "job well done" bow to his fellow indigenous comrades before disappearing into the exotic landscape from whence he came. Remember what I said about a great script shining through despite abysmal direction? Paul Haggis (writer of Million Dollar Baby) does exceptionally well on both accounts in his directorial debut Crash. The film showcases the lives of an ethnically (and socio-economically) diverse group of Americans living intereconnected lives in modern-day Los Angeles. How these lives, artificially separated by culture and color, inseparably intertwine in the city is a concentrated mirror of multi-ethnic America today. In a sense, post-9/11, Haggis may be hinting to issues brought about by a globalizing multi-ethnic world where differences in appearance and practices are more visible than our common humanity. The stories are stories of people who happen to be white, black, Latino, Asian, Middle Eastern and all else in between. While Haggis makes the point that these are stories of people, their color and socio-economic background are at the same time inseparable from who they are. In a supposed "politically correct" portrayal of America today, Haggis demonstrates that these biases nevertheless remain. Racial slurs are abundant in the film, and while we may cringe at hearing the characters say them, we've a sense that real people in real-life America, think and say them nonetheless. The performances of the stellar cast are impeccable, understated and incredibly effective. Sandra Bullock, usually known for her likeable, girl-next-door comedic performances, is believable as a rich "desperate housewife." Memorable also are the interpretations of Thandie Newton as a middle class black woman and Don Cheadle as a black cop. Look out for rapper Ludacris' portrayal of a thief who philosophizes about the young black man's struggles in white America. While far from knee-slapping funny, his particular vignette provides some easing of the perpetual tension Haggis keeps his audience in. There are a few excruciatingly moving scenes to watch. Crash is a small movie about big ideas. Like poetry on screen, it is lyrical, short, profound and to the point. It is poignant, quiet and yet powerful. Despite the title, no explosions here. In a class on public finance and fiscal policy I dropped last semester, I asked my professor if he ever thought HIPCs' (Heavily Indebted Poor Countries) debts will ever be "forgiven." With hardly any hesitation he said, "What's the point of lending if you decide not to collect?" Maybe not in this lifetime. A portion of the multilateral debt of the qualifying countries will be written off, but the amounts involved are small and will lead to reduced aid disbursements for the ‘beneficiaries’. The eighteen eligible HIPC countries are due to have $40 billion worth of debt held by the World Bank, Africa Development Bank (AfDB) and IMF cancelled in full. If the other nine HIPC countries manage to qualify by reaching ‘completion point’, the total multilateral debt cancellation could rise to $51 billion and, in the least likely scenario, $55 billion may be written off if but only if all of the final eleven make it. $55 billion is just this country's external debt alone. There really is no such thing as free lunch. Yesterday was first day of the UPCAT. For those not in the know, it is the premier state university's entrance exam. Because I'd totally forgotten, I agreed to meet with my best friend at the UP shopping center. Traffic in and around UP at this time is usually a nightmare. Especially along Katipunan. I'd like to think its because for every kid who takes the exam, her immediate family, her lolos, lolas, uncles, aunts, cousins (even neighbors) insist on tagging along for "moral support." Hehe. Anyway, I was able to fetch my friend at the shopping center and since the University Avenue was crawling, we went out through that road at the back of the College of Music onto Commonwealth. As we made the U-turn heading back to the Circle, traffic slowed considerably under the overpass. There was a young man in his late teens harassing cars on the road. He was totally naked. Too bad I didn't have a camera handy (and no boyfriend with a phone-cam this time). It was 1 o'clock in the afternoon, roughly an hour after the first batch of examinees would have finished. Perhaps, for the kid who'd gone naked on the avenue, the test proved too much. Bilang isang bagong tagatangkilik ng "malayang" pelikulang Pilipino, natutunan kong maging mapagpasensya bilang manonood. Sa aking mumunting karanasan sa mga obrang ito, at base na rin sa mga huli kong napanood (Sa Aking Pagkagising, Pinoy/Blonde, Room Boy), kadalasang "mabagal" ang mga unang 15 minuto ng eksposisyon. Marahil na rin siguro dahil sa nasanay na tayo sa estilong Hollywood kung saan mabilis ang editing at ang takbo ng kwento. Ngunit sa kalauna'y iigting ang sayaw ng naratibo at ang manonood ay unti-unting maakit ng mga karikaturang biglang nabigyang buhay sa dunong at galing ng mga lumikha ng pelikula. Kailangan lang ng kaunting pasensya. Kagabi ay isa ako sa mga 200-300 taong nagbukas sa CinemaOne Digital Festival sa UP Film Center. Tulad ng dati, kapag indie film ang pinapanood ko, handa ako sa kahit ano. Bukas ang isip. Pinapagpapaliban ang mga puna. Pero, isang oras na ang nakaraan, mukhang naghintay ako sa wala sa obra ni Jon Red (kapatid ng pamosong si Raymond Red). 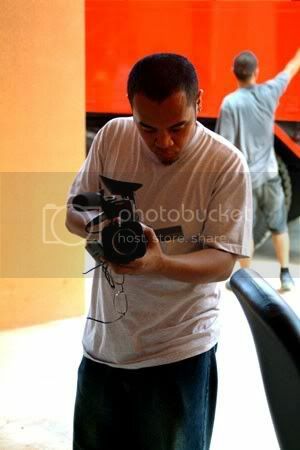 Ang kwento ay tungkol sa isang grupo ng filmmakers na gumawa ng isang documentary tungkol sa tiwaling kapulisan. Ipinain nila ang kanilang aktor na si Roman (ginampanan ni Ryan Eigenmann). Sa huli'y di na nila nakontrol ang mga kaganapan at tuluyan ngang nabiktima ang aktor. 1. Komedi o Drama? Para bang 'di malaman ni Red at ng ganyang manunulat na si Ogi Sugatan kung komedi ba o drama ang pelikulang ito. Wala namang nagsasaad na 'di maaaring pagsamahin ang dalawang genre, pero kung gusto mong magpatawa, siguraduhin mong nakakatawa. Hilaw ang lahat ng mga sana'y katawa-tawang dialogue at kaganapan sa pelikula. 2. 'Wag kang mangako sa wala. Nangako ng suspense at drama ang unang eksena ng pelikula. May lalaking biktima ng dalawang tiwaling pulis. May tubo. Pinamalo, pinanghataw at ginamit sa kahindik-hindik na paraan sa isang maselang bahagi ng katawan. Pagktapos ay biglang bawi sa isang sarkastikong acceptance speech ng direktor (ginampanan ni China Cojuangco). Ang labo. Nangangalahati na ang kwento pero 'di nagbalik ang tensyon na ihinain ng pambukas na eksena. 3. Nasaan ang mga aktor? Bagamat may ilang piling aktor tulad ni Eigenmann, kahina-hinala ang pagpili ni Red kay China Cojuangco para sa mahalagang role ng direktor. Kahit ang mga 'di kilalang gumanap sa role ng dalawang tiwaling pulis ay 'di kapani-paniwala. Ultimong takbo ng mga dialogo ay 'di normal. Nagdirihe kaya si Jon Red? 4. Nasaan ang kwento? Basta't maganda ang script, kahit anong pangit ng direksyon, makikita ang ganda ng kwento. Sa lagay ng Anak ng Tinapa (na tinawag ni Sugatan na "Fish Chips"), kulang pa siguro ng reyalidad ang mga linya. Bilang isang Pilipinong 'di madalas tumangkilik ng pelikulang Pinoy, tila ba pambihirang kaloob ang mga lokal indie films ng kasalukuyan. Panibago ito sa ating panahon. Kaya naman, sa tuwing may mga festival tulad nito, hanggat maari'y nais kong tangkilikin ang lahat. Ngunit anak ng tinapa ang Anak ng Tinapa. Sayang! Ah, when it rains, it pours. In the recent years, Manileños have developed a taste for "art house-y" types of films, thanks to the many foreign film festivals we've been bombarded with in the past few years. The French (running for some seven-eight years now) and the Pink Film in June, the Cinemanila in August, the Cineuropa in September, the fledgling Japanese, Spanish, Italian, German, Canadian and Portuguese festivals. A film buff's orgasmic delight. Film fest season in the Philippines welcomed the recently concluded all-Filipino Cinemalaya festival. Quick to follow suit is the new CinemaOne Originals. If you missed the SM Megamall screenings, you can still catch them this week at the UP Film Center in Diliman. Action Thriller. Dilim is an enigmatic creature that roams the streets at night and does vigilante work, saving innocent victims by literally devouring the villans. Conflict ensues when a do-good policeman goes hot on his trail. Ten scenes, each one involving a man and a woman in a bantam car traveling northward along the North Diversion Road. The recurring theme: infidelity of the man. Jack, a middle-aged guy, is fired from his human resources job of 20 years. This prompts to contemplate on suicide but he chances upon a taxi driver whose stories encourage him to get into the cab business and succumb to the probable dangers that come with it. Even if it means shame in the culture he belongs to, he will get what he desires, privacy. And hopefully, death. Is about the dramatic and sometimes humorous life and times of the Sandalang family. It's a film about facing the past and owning up to the truth that resides in the bleakest corner of the soul. This is seen in the interetwining lives of the 3 Sandalang sisters. Anak ng Tinapa is a story about small fish: framing-up and killing small fry instead of the big fish in a society ruled by sharks. Two crooked cops get a kick out of framing up hapless people by planting illegal drugs on them. Unknown to these rogue policemen, a group of loony and ambitious student filmmakers is watching and documenting their every move. In the end, a brutal killing spree of individuals occurs. Ang Anak Ni Brocka is a mockumentary. It is about a group of investigative journalists from a sub-par TV station who accidentally scores a scoop that a twenty-year old boy is looking around for his identity. What's very controversial about the boy's identity is that he claims to be the son of the late famous director Lino Brocka, a known gay filmmaker. Cast: Nonie Buencamino, Roence Santos, Bombi Plata, Raul Morit, Adrian Ramirez, Raph Hernandez, Ronald Tupas and Soliman Cruz. With special appearances by Gina Alajar, Bembol Roco, Joonee Gamboa, Christopher de Leon, Phillip Salvador.